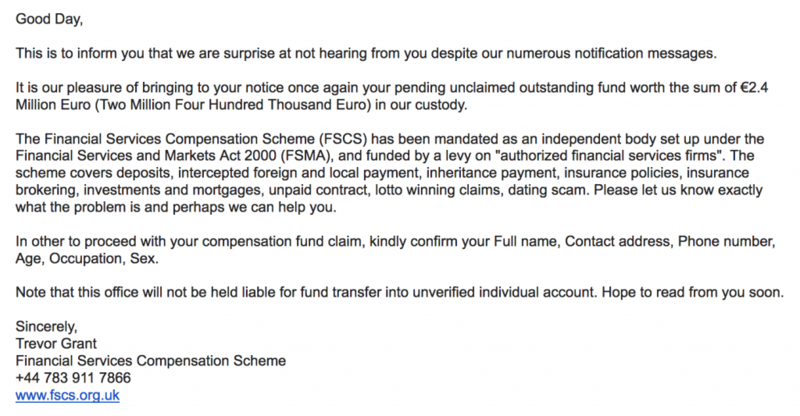 I received a scam email from someone who claimed to be from the UK’s Financial Services Compensation Scheme which I have been following up with the organization who has now handed it over the police. A journalist at the Financial Times, Rachel Addison, picked up the story. The text of the email is below. It wasn’t addressed to me personally, just a “Good Day”. English is very poor including many spelling mistakes. “Hope to read from you soon” – LOL. Some text copied from the website, some obviously weren’t. I’ve never had any relationship with this organisation. Going through their LinkedIn page there is no one of that name there. Most telling is reviewing the email headers which is a reply-to email address of a company in Russia. Obviously, the best policy is to not to click on any of the links, do not reply to their email or phone them, mark the email as junk and ensure it’s been deleted. If they are fraudulently impersonating an organization then you could report it to them.